There are relatively few pitfalls for the inexperienced player in these bonuses, but they are all clearly explained below. Since this page is quite long, I suggest you use the contents links below to navigate to the various sections. Partial information and the bonus "claim form" can be found on the welcome bonus page, and the full terms relevant to this bonus are located in the full bonus terms. • Ten times if you play slots and/or keno. • Twenty times if you play cyberstud poker games. • One hundred times for all other games. Pontoonbet, Pokerbet, Casino Tournaments, Live Dealer Casino and Vegas Strip Blackjack are excluded from welcome bonus qualifying requirements. Play on these games will not count towards qualification of the welcome bonus or turnover. Play on casino games through Ladbrokespoker.com and Ladbrokesgames.com does NOT count towards qualification for this promotion. It's unclear whether play on these games / platforms would simply not contribute to the wagering required to release the bonus, or would in fact result in loss of any subsequent winnings. As such, I would recommend avoiding any doubt and steering clear of the above four games, as well as the Live Dealer Casino, poker and games platforms while the bonus is in play. Ladbrokescasino.com reserves the right to exclude players from this and all future promotions if we have reason to believe they are abusing this promotion...the promoter reserves the right to refuse any offer to any player for any reason, or to withdraw/change an offer at any time. No correspondence will be entered into. This entitles Ladbrokes to confiscate winnings for undisclosed reasons. However, to the best of my knowledge this has never happened, so it should not be cause for concern, particularly considering the size, reputability and longevity of Ladbrokes. So: follow the above procedures for claiming the bonus and cashing it out, and you should be fine. The information relevant to the 32red signup bonus is located on the welcome bonus and bonus terms pages. Casino War counts at 50%, so you need to wager twice the basic (32 times) amount. On a £64 bonus, this would work out as (32 X 64) X 2 = £4096. 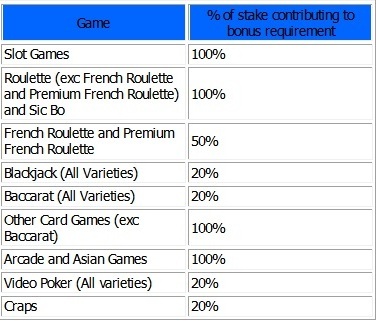 There is a maximum stake of 6.25 Chips (or coin equivalent) per bet until the playthrough requirement has been met. For the purposes of this rule a Bet is defined as one roulette spin or one dealer's dealt hand in any table game, or one deal in any Video or Power Poker game (this includes Multi-Hand/Play games). Any winnings derived from bets larger than these limits before playthrough requirements for that bonus have been met will initiate a further playthrough requirement of 100 times the amount won. Although 32Red will not confiscate any winnings from bets that exceed the maximum allowed amount, the additional 100 times wagering penalty incurred could result in an awful lot of extra wagering before the bonus is fully released. Apart from this potential wagering penalty, there are no disadvantageous rules in the 32Red bonus. The information relevant to the Intercasino signup bonus is located on the first deposit bonus page. Brief summary: before depositing, enter the Bonus Code IC250 into the box provided in the cashier section of the casino software; deposit from £10 to £250 and you'll receive a bonus matching this amount; wager deposit and bonus 12 times to release the bonus. 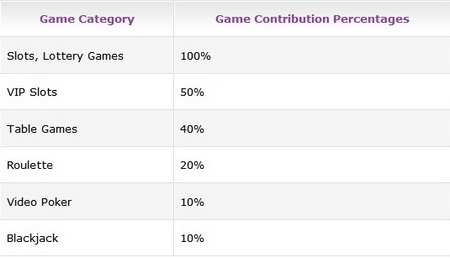 Bear in mind that not all games are equally weighted, and some games are specifically excluded - see below. If you played roulette, which counts at 20%, you'd need to wager the total amount an additional five times. On a £250 bonus, this would work out at (500 X 12) X 5 = £30,000. 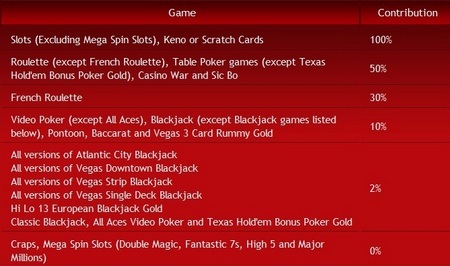 The following games are ineligible and DO NOT count towards the wagering requirements: Pontoon, Single Deck Blackjack, Superfun 21, Red Dog, Casino War, Texas Hold'Em Bonus, Solitaire, Craps, Slot Tournaments, Baccarat or Baccarat Mini. In the event a player should use bonus funds to play ineligible games PRIOR to meeting the wagering requirements on eligible games, InterCasino reserve the right to refuse withdrawals, remove bonus money and winnings without notice and lock all accounts of players found abusing this rule. In the interests of fair gaming, players may not place individual bets equal to or in excess of 25% or more of the value of the bonus credited to their account until such time as the wagering requirements for that bonus have been met. InterCasino reserves the right to refuse withdrawals, remove bonus money and winnings without notice and lock all accounts of players found abusing this rule. So: don't play ineligible games, and don't bet more than 25% of your bonus on any one hand, or you risk having your funds confiscated. The information relevant to the Betfair signup bonus is located on the welcome program page and in the standard casino terms. In brief summary: open an account with Betfair and fund it; then, download the software and transfer between £25 and £100 to the casino; the matching bonus will be added to your account; wager the deposit plus bonus amount 20 times, and the bonus will be released. You can also subsequently claim two more bonuses, between a minumum of £25 and maximum of £50, on your subsequent two deposits, making for a total of £200 in signup bonuses. As is almost invariably the case, the games do not all count the same for release of the bonus, and some games are specifically excluded - see below. Unless otherwise stated by Betfair Casino, stakes on...Euro Roulette, Common Draw Single Zero Roulette, Craps, Baccarat, Single Deck Blackjack, Zero Roulette, Zero Baccarat, Zero Blackjack, and Zero Jacks or Better do not qualify towards the qualifying wagering requirements. It's unclear whether play on these games would simply not contribute to the wagering required to release the bonus or would in fact result in loss of any subsequent winnings. As such, I would recommend avoiding any doubt and steering clear of these games while the bonus is in play. If Betfair becomes aware of a customer who, in the course of participating in a promotion or offer, has become able to guarantee wins and/or profits with no or only minimal risk, and/or benefits from a promotion or offer by participating through more than one Betfair account, and/or displays irregular or unusual playing or betting patterns which Betfair deems to be abusive, Betfair may in its absolute discretion elect to do any one or more of the following: (i) close the customer's account(s); (ii) invalidate the transactions or game play which was in contravention of this term; and/or (iii) withhold the customer's winnings from such transactions or game play. The reference to "minimal risk" and "irregular betting patterns" is a nonsense. Since my recommendation for Betfair is the Zero Lounge games, which do not qualify for bonuses, I would suggest steering clear of the Betfair bonuses altogether on the basis of this nonsense clause. I should add that I've played many Betfair bonuses myself and have never had any problem, much less accusations of "irregular playing patterns". So: don't touch any of the excluded games and you should be alright. However, bear in mind that Betfair carries that draconian clause, and the might invoke it at will. The information relevant to the Totesport signup bonus is located on the welcome bonus page, and also in the Totesport terms. In summary: deposit or transfer up to £100 into the casino to receive the bonus; once received, wager the bonus amount 40 times in order to withdraw it, within 14 days of the bonus being credited or it'll be removed. There are no game exclusions at Totesport. Neither are there any maximum bet restrictions for bonus play. This must be a mistake, as it directly contradicts the weightings chart in which these three games are allowed. However, to avoid doubt, I would avoid playing roulette, baccarat and craps when the bonus is active. We reserve the right to refuse or rescind the bonus for any reason, including, but not restricted to, player abuse. I think it's unlikey that an operation of Totesport's long standing would invoke this clause against a legitimate player on their first deposit. As such, with the caveat of the contradiction over roulette, craps and baccarat, there are no problematic terms here. All information relevant to the Blue Square signup bonus is located on the welcome bonus page. In summary: deposit up to £100 to receive the bonus; then, wager your deposit amount 20 times on slots, jackpot slots and number games only in order to be able to cash it out. Bets on Multiplier, Punto Banco, Craps or ANY form of Roulette or ANY form of Blackjack or Video Poker or Top Trumps do not count towards the total stake. The promotion is available on slots, jackpot slots and number games only. There are no maximum bet restrictions. The terms for this bonus are clear and simple, and present no problems as long as you remember that many games do not qualify for the wagering.